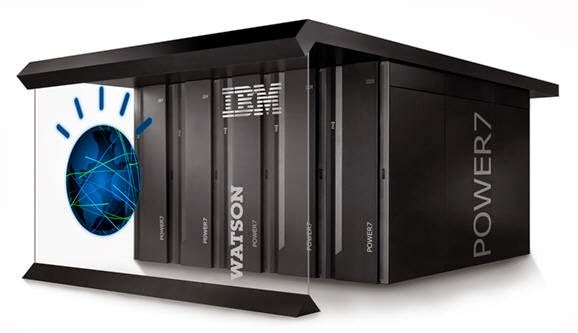 Maybe you have heard of Watson or Deep Blue, maybe even Watson, but you have definitely heard of IBM. International Business Machines or IBM has been manufacturing computers for many, many years. After developing a very successful business and making very large sums of money, IBM has spared some of their top engineers to do some very cool things,breaking boundaries while they are at it. Deep Blue, with the aid of a human interpreter, in a chess match with the world champion. First came Deep Blue. 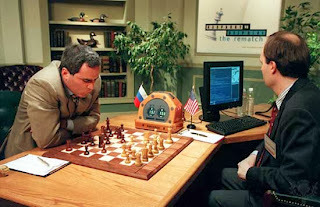 On May 11th, 1997, the IBM Deep blue defeated the world chess champion after six games over several days. Man versus Machine, Machine versus Man. It may seem that IBM has spent so much money just to win one game of chess but that one game was just the door that led to a new level of integration of computers in our society. After the match, Deep Blue was put to work with many different tasks such as developing new medical drugs, calculate financial models, handle database searches, and complete massive calculations in various fields of science. That one match of chess had led to a breakthrough in computer science, pushing the boundaries of what computers can do. A BlueGene /P the Argonne National Laboratory, in Lemont, Illinois. A “few” years later in 2004, the BlueGene /L made history for its own. It was the most powerful, energy efficient, and space efficient supercomputer at its inception. Originally developed to aid in the observation of the invisible processes of protein folding and gene development, BlueGene was designed with a scientific purpose. In 1999, the supercomputing world was met with a big challenge. To increase computing power there were two ways, the easy way and the better way. The easy way would be to increase power consumption and floor space of these HPCs to accommodate the hardware needed. The better way would be to develop efficient systems to allow for increased computational power in the same power profiles and floor space. The BlueGene /L released in 2004 contained 32 dual-processor nodes on one microchip to dramatically save space and reduce power consumption. The power of BlueGene was quickly adopted, partly because of their choice of using Linux as the base operating system and IBM’s support for open source development of its applications. From universities to governments to research labs, BlueGene greatly impacted all of these fields. BlueGenes have mapped the human genomes, replicated brain power, and many other amazing things, pushing the boundaries. 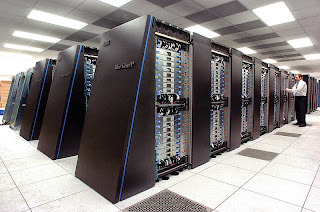 Even to this date, the BlueGene architecture is considered one of the greenest and most powerful supercomputers. Watson, a supercomputer running on clusters of Power 750 Computers. Then came Watson, the most “human” out of the three. Watson was built to compete on Jeopardy! against the two all-time best Jeopardy! champions. Watson’s goal was to use text-to-speech technology to understand natural language and use the interpreted data in a useful way, like looking for the answer to the Daily Double. Watson is a search engine at heart but it is so much more. It is able to understand natural human speech, deem what information is important, and search its database for the answer. Watson’s ability to find the answer to the trickiest of Jeopardy! questions is amazing. It looks through unstructured databases for keywords to find and rank the most probable answers. And all of this happens in one or two seconds. Its database included mountains of data from the World Book Encyclopedia to Wikipedia and Project Gutenberg, an open book sharing project. With over 100 algorithms to analyze the question paired with 90 servers with 2880 processors running IBM’s DeepQA software, no wonder it won, twice. It was not perfect, by far. Watson said that Toronto is an American city in the Final Jeopardy! With it’s game show days behind, the technology in Watson like his natural speech engine have been used for many applications from large corporations to call centres. Watson understands, most of the time, what it is being asked to do in natural language as a human would. The future where we can all be like Tony Stark and pose questions to Jarvis is not too far away. In IBM’s 101 year history, it has led the pack and has broken down technical barriers to expand the capabilities of computer science. Now that many other companies are pushing the boundaries, supercomputers will continue to play vital roles in our society.